[XT,T] = interpolate(MDL,Times,Paths) performs a Brownian interpolation into a user-specified time series array, based on a piecewise-constant Euler sampling approach. [XT,T] = interpolate(___,Name,Value) adds optional name-value pair arguments. Many applications require knowledge of the state vector at intermediate sample times that are initially unavailable. One way to approximate these intermediate states is to perform a deterministic interpolation. However, deterministic interpolation techniques fail to capture the correct probability distribution at these intermediate times. Brownian (or stochastic) interpolation captures the correct joint distribution by sampling from a conditional Gaussian distribution. This sampling technique is sometimes referred to as a Brownian Bridge. The default stochastic interpolation technique is designed to interpolate into an existing time series and ignore new interpolated states as additional information becomes available. This technique is the usual notion of interpolation, which is called Interpolation without refinement. Alternatively, the interpolation technique may insert new interpolated states into the existing time series upon which subsequent interpolation is based, by that means refining information available at subsequent interpolation times. This technique is called interpolation with refinement. Interpolation without refinement is a more traditional technique, and is most useful when the input series is closely spaced in time. In this situation, interpolation without refinement is a good technique for inferring data in the presence of missing information, but is inappropriate for extrapolation. Interpolation with refinement is more suitable when the input series is widely spaced in time, and is useful for extrapolation. It is helpful to examine a small interval in detail. The solid red and blue dots indicate the simulated states of the bivariate model. The straight lines that connect the solid dots indicate intermediate states that would be obtained from a deterministic linear interpolation. Open circles indicate interpolated states. Open circles associated with every other interpolated state encircle solid dots associated with the corresponding simulated state. However, interpolated states at the midpoint of each time increment typically deviate from the straight line connecting each solid dot. You can gain additional insight into the behavior of stochastic interpolation by regarding a Brownian bridge as a Monte Carlo simulation of a conditional Gaussian distribution. 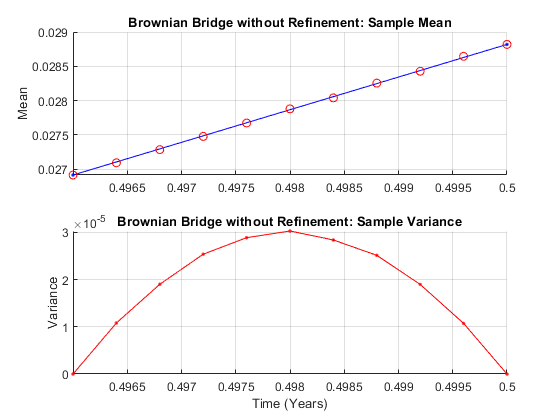 This example examines the behavior of a Brownian bridge over a single time increment. The following graph plots the sample statistics of the first state variable only, but similar results hold for any state variable. The conditional mean of each state variable lies on a straight-line segment between the original simulated states at each endpoint. The conditional variance of each state variable is a quadratic function. This function attains its maximum midway between the interval endpoints, and is zero at each endpoint. The maximum variance, although dependent upon the actual model diffusion-rate function G(t,X), is the variance of the sum of NBROWNS correlated Gaussian variates scaled by the factor dt/4. The previous plot highlights interpolation without refinement, in that none of the interpolated states take into account new information as it becomes available. If you had performed interpolation with refinement, new interpolated states would have been inserted into the time series and made available to subsequent interpolations on a trial-by-trial basis. 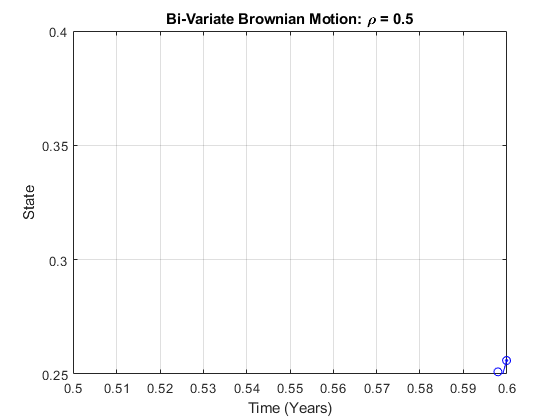 In this case, all random draws for any given interpolation time would be identical. Also, the plot of the sample mean would exhibit greater variability, but would still cluster around the straight-line segment between the original simulated states at each endpoint. The plot of the sample variance, however, would be zero for all interpolation times, exhibiting no variability. Stochastic differential equation model, specified as an sde, bm, gbm, cev, cir, hwv, heston, sdeddo, sdeld, or sdemrd object. All MDL parameters are assumed piecewise constant, evaluated from the most recent observation time in Times that precedes a specified interpolation time in T. This is consistent with the Euler approach of Monte Carlo simulation. Interpolation times, specified as a NTIMES element vector. The length of this vector determines the number of rows in the interpolated output time series XT. Sample paths of correlated state variables, specified as a NPERIODS-by-NVARS-by-NTRIALS time series array. For a given trial, each row of this array is the transpose of the state vector Xt at time t. Paths is the initial time series array into which the interpolate function performs the Brownian interpolation. Observation times associated with the time series input Paths, specified as the comma-separated pair consisting of 'Times' and a column vector. Flag that indicates whether interpolate uses the interpolation times you request (see T) to refine the interpolation as new information becomes available, specified as the comma-separated pair consisting of 'Refine' and a logical with a value of True or False. The interpolate function runs processing functions at each interpolation time. They must accept the current interpolation time t, and the current state vector Xt, and return a state vector that may be an adjustment to the input state. If you specify more than one processing function, interpolate invokes the functions in the order in which they appear in the cell array. You can use this argument to specify boundary conditions, prevent negative prices, accumulate statistics, plot graphs, and so on. 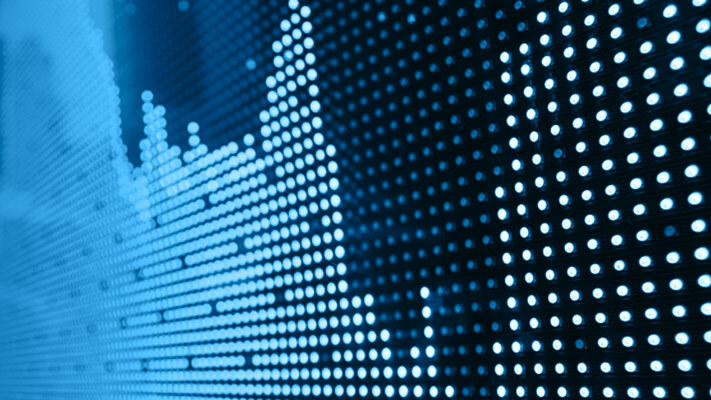 Interpolated state variables, returned as a NTIMES-by-NVARS-by-NTRIALS time series array. For a given trial, each row of this array is the transpose of the interpolated state vector Xt at time t. XT is the interpolated time series formed by interpolating into the input Paths time series array. Interpolation times associated with the output time series XT, returned as a NTIMES-by-1 column vector. If the input interpolation time vector Times contains no missing observations (NaNs), the output of T is the same time vector as Times, but with the NaNs removed. This reduces the length of T and the number of rows of XT. This function performs a Brownian interpolation into a user-specified time series array, based on a piecewise-constant Euler sampling approach. X is an NVARS-by-1 state vector. F is an NVARS-by-1 drift-rate vector-valued function. G is an NVARS-by-NBROWNS diffusion-rate matrix-valued function. Given a user-specified time series array associated with this equation, this function performs a Brownian (stochastic) interpolation by sampling from a conditional Gaussian distribution. This sampling technique is sometimes called a Brownian bridge. Unlike simulation methods, the interpolation function does not support user-specified noise processes. The interpolate function assumes that all model parameters are piecewise-constant, and evaluates them from the most recent observation time in Times that precedes a specified interpolation time in T. This is consistent with the Euler approach of Monte Carlo simulation. When an interpolation time falls outside the interval specified by Times, a Euler simulation extrapolates the time series by using the nearest available observation. The user-defined time series Paths and corresponding observation Times must be fully observed (no missing observations denoted by NaNs). The interpolate function assumes that the user-specified time series array Paths is associated with the sde object. For example, the Times and Paths input pair are the result of an initial course-grained simulation. However, the interpolation ignores the initial conditions of the sde object (StartTime and StartState), allowing the user-specified Times and Paths input series to take precedence.